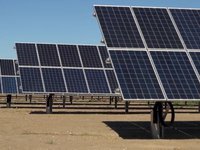 JSC Ukrgazvydobuvannia plans to build a solar power plant with a capacity of 3.078 MW in Andriyivka (Kharkiv region) where the Shebelynka gas refinery is located, according to a report in the ProZorro e-procurement system. The expected cost of the construction project is UAH 82.324 million. The tender documents could be submitted before December 6, 2018. Ukrgazvydobuvannia, fully owned by Naftogaz Ukrainy, is Ukraine's largest gas producer, which provides about 75% of the total gas output in the country. As reported, early 2018, another company of Naftogaz Ukrainy – Ukrtransgaz – launched a solar power plant with a capacity of 0.3 MW.